Even God had to rest a day, right? I usually try to carve out one day on tour that is strictly to have fun. That day was today. We started the day by sleeping just a tad extra. We left for Six Flags at about 9:30. 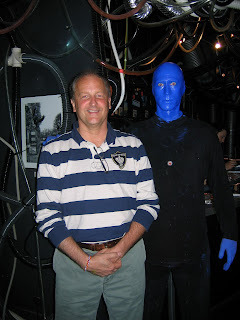 After a nice day there, we returned, changed, and then went out for pizza and to see Blue Man Group. Returned to the hotel, had a short devotional, and then dismissed for bed. Had a lot of fun at Six Flags. Rode several roller coasters. My favorite was the raging bull. It's the tallest coaster in the park. I think most folks rode coasters, although a few opted out. Special thanks to Sally W for sitting in Johnny Rockets all day long waiting for checkin! I'm pretty sure that (along with watching my backpack) is an important job. 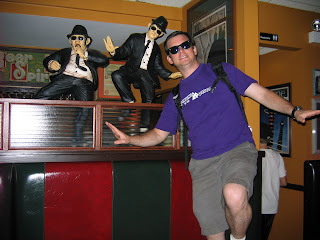 The pizza dinner was very tasty, but the best part of the dining experience was my photo op with the Blues Brothers. Several folks led devotional tonight. They compared experiencing God with a roller coaster. Inventive. very nice. 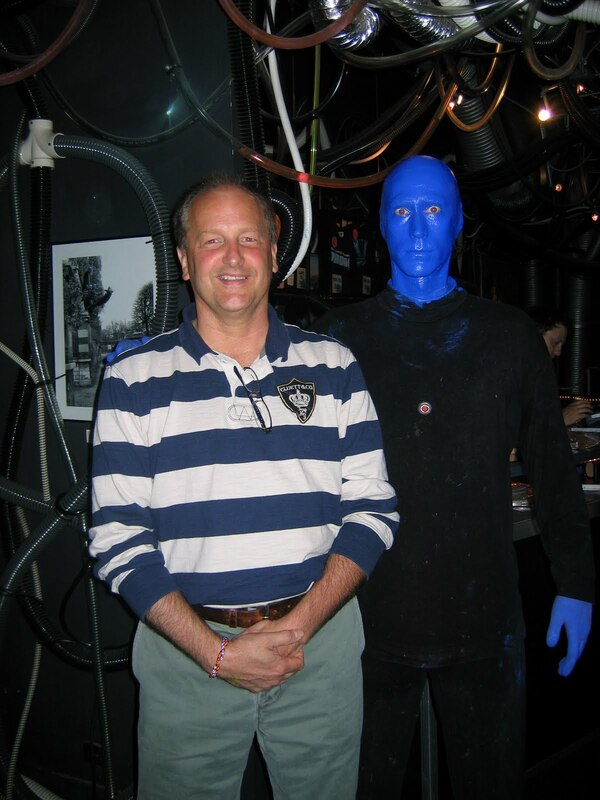 For my part, I talked about how the blue men show so much emotion with just their eyes and gently suggested we are capable of just as much. Tomorrow we drive to Louisville, sing a concert, check in to our hotel, and eat dinner. Should he nice. uhoh - you owe sally a favor! what's the count at now? yes....waiting for that one. Of course Danny I did volunteer. Hey, I had to find useful jobs anyway I could.